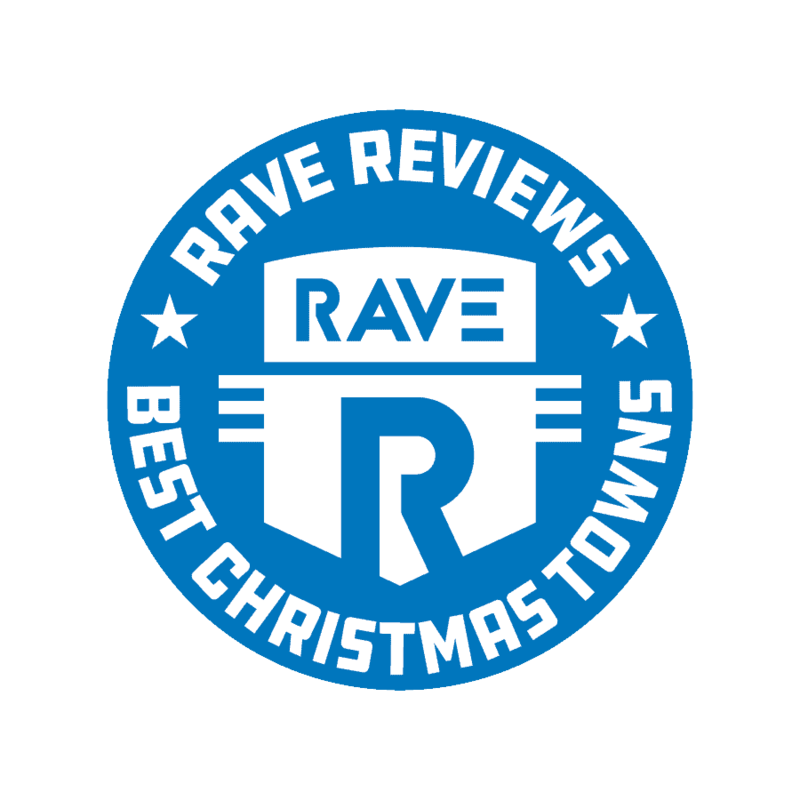 Everyone at RAVE Reviews is wearing tinsel and jingle bells…we just can’t tell you where we’re wearing them. We love Christmas around here. 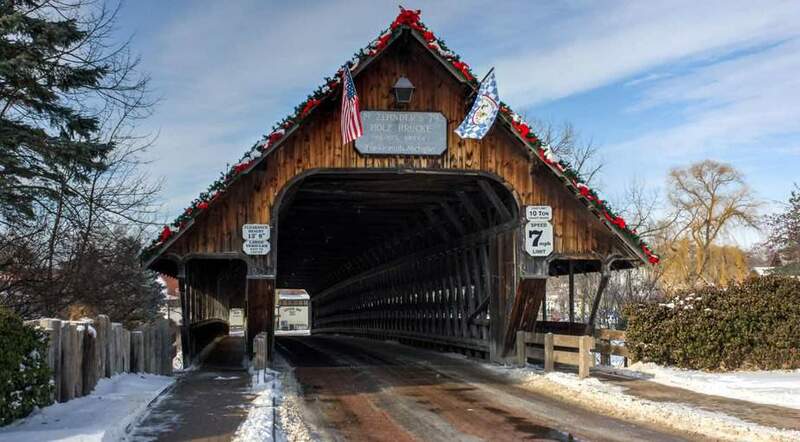 In this ranking, we’re celebrating the 25 best Christmas towns in America. Each one is guaranteed to be filled with lights, tinsel, and good cheer. And speaking of lights and tinsel, folks have been celebrating Christmas for centuries. For nearly that entire time, Christmas decorations have been part of the holiday. Here’s some background on traditional Christmas decorations still popular today. Today we think of tinsel as strips of shiny silver-colored plastic. And a little like glitter, or your last Tinder date, tinsel is fun at the time but difficult to get rid of. Fact is, tinsel as a Christmas decoration goes all the way back to Germany in the 1600s. Back then, tinsel wasn’t made from strips of plastic but actual silver – yes, real silver. Eventually, tinsel production was automated. Over the years, people tried making tinsel from both tin and lead, but both were too heavy for Christmas trees. Eventually, the British developed the kind of tinsel we know and love today. Hanging ornaments from your Christmas tree is a time-honored tradition – whether they’re ancient 1st grade craft projects, honored family heirlooms, or the ever-present spherical shaped, shiny Christmas baubles. Again, the Germans began decorating their trees with shiny doo-dads way back in the 1840s. Those early decorations were fruit and nut shaped, but they soon evolved into the more familiar spherical look we know today. England’s Queen Victoria took a shine to the practice, and it spread across Europe. After American retailer F.W. Woolworth began importing bauble in the 1880s, the practice came to the States. When the baubles began to be mass-produced in plastic, prices dropped and the tradition of hanging them on our Christmas trees was here to stay. When it comes to Christmas decorating traditions, Christmas trees are the heavy-weight. Truth is, the practice of using evergreen trees for winter celebrations goes all the way back to pre-Christian times. The Saxons are believed to have decorated their homes with evergreen branches to remind them spring was just around the corner. The Romans picked up on the practice of using trees to decorate their temples at their Festival of Saturnalia, and for the Christians, trees came to symbolize everlasting life with God. Nobody knows for sure when Christmas trees came into the picture. Some speculate around 1000 AD. Weirdly, early Christmas trees seem to have been hung upside down inside the home. These days, many people use fake Christmas trees. But overall, real-deal Christmas trees remain as popular as ever. In Queen Victoria’s time, candles were used around Christmastime to represent stars in the night sky. This practice holds strong in several areas of Europe. In America, insurance companies – of course – put a kibosh on the candles: too much of a fire hazard, they believed. Right around 1895, the first electric Christmas light was invented and they’ve remained relatively unchanged since then. These days, with block-wide Christmas light decorating events now common, it’s hard to imagine Christmas without those twinkly lights. Besides the common decorations previously mentioned, here are a few more Christmas-time classics that shouldn’t be overlooked. But I think we can all agree the best Christmas decorations are the ones that have personal meaning. Some get passed down through the years. Others are simply smooshed-up and dried-out pieces of clay, hanging from a ribbon with “ho ho ho” painted on them. Remember that one from kindergarten? Either way, Christmas decorations with personal meaning are what the season — and the practice of decorating for the holidays — should be all about. What better way to celebrate the season than by visiting one of the towns with the most Christmas cheer? You might even start a new holiday tradition of your own. Whether you find yourself near one of these locations, or if you plan a trip specifically to visit, find out how these people get down and decorate in America’s Best Christmas towns. When compiling this list, RAVE Reviews triangulated similar lists from House Beautiful, Country Living, Simplemost.com, regional travel websites, and more. In our list, we gave each town a “Jingle Score” ranging from 1-10 jingle bells. 1 being an okay Christmas town, and 10 being pure Christmas joy. For some of these towns it’s always Christmastime, and that’s just fine by us. Now you’re up to speed on the most common Christmas decorating traditions. So let’s take a look at how America’s best Christmas Towns practice next-level holiday cheer. Put on some footy PJs and enjoy. Not too far away from the bustling metropolis of Seattle, the snowy mountain village of Leavenworth is absolutely packed with yuletide good cheer and holiday magic around Christmastime. 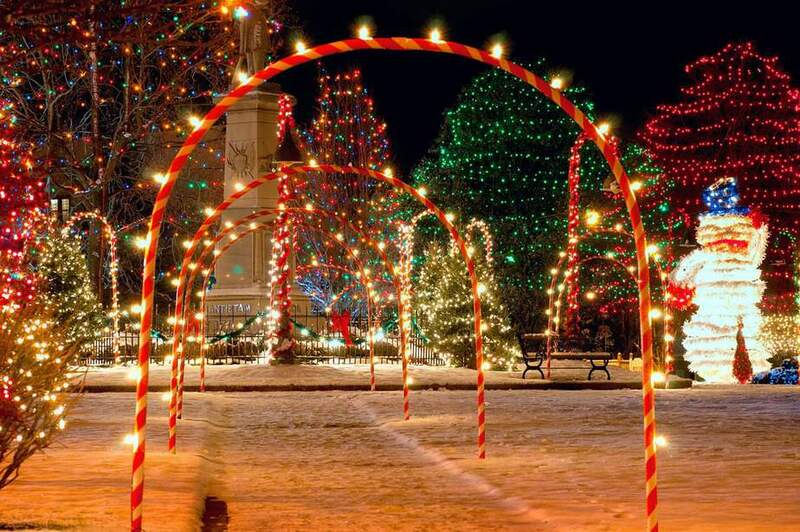 Don’t miss Leavenworth’s good old-fashioned Christmas Lighting Festival, when the whole town comes alive with twinkly lights. Book early, however, because the light festival always sells out. There are some amazing mountain views in Leavenworth, as well as plenty of boutique holiday shopping options for last-minute gifts. For beer fans, there are deliciously good suds to sample at Icicle Brewing. Or if wine is more your thing, try Rhein House or Hard Row to Hoe Vineyards. And when it’s time to eat, head straight to the Sausage Garten, Sulla Vita’s, or the Watershed Café. Try sledding at Front Street Park, take a sleigh ride, or listen to alpine horns in the town’s square. Overall, Leavenworth is an incomparable place to spend the holidays: whether solo, as a couple, or with your family and friends. Yeah, you read that right. 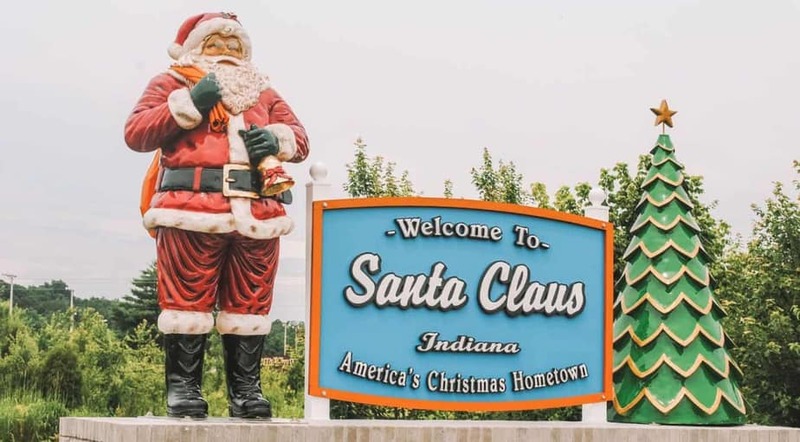 There’s a town in Indiana called Santa Claus. And Santa Claus, IN celebrates their namesake every December with their 3-weekend Santa Claus Christmas Celebration. At the event, you can pose for a family photo in front of a 22-foot-tall Santa statue. 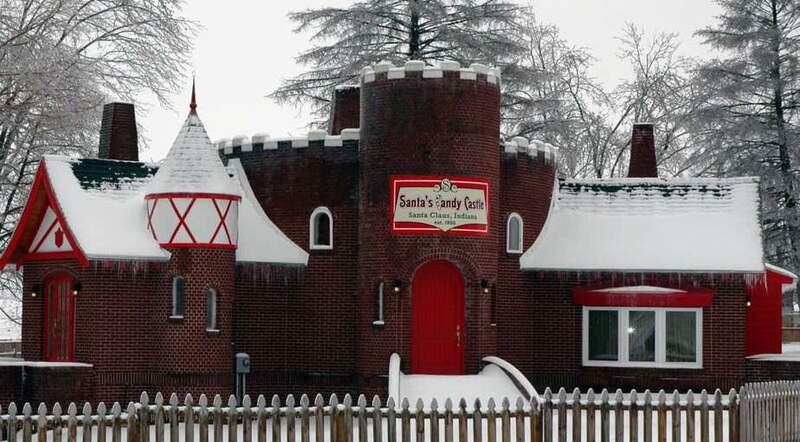 Then, delight in delectable homemade confections from the historic Santa’s Candy Castle. Later, enjoy Christmas Dinner with Santa at Santa’s Lodge. Also in Santa Claus, you can spot Santa statues dotted all over town. Or marvel as Santa’s Giant LED Tree of Lights performs a choreographed light show in Kringle Place Shopping Center. In fact, Santa shows up all over the town that shares his name. After all, it’s the only place in the world where you can hand cancel holiday mail with the one-and-only Santa Claus Postmark. Kids (of all ages) can write a letter to Santa in the original Santa Claus Post Office and get a reply from the big guy in red. And don’t miss your chance to visit with Santa Claus himself at the Santa Claus Christmas Store. Other special events include the Santa Claus Christmas Parade, Chestnuts Roasting on an Open Fire, the Santa Claus Arts & Crafts Show, Das Nikolausfest, Dancer’s Dash 5K, the Festival of Lights, and so much more. While in Santa Claus, shop for last-minute gifts at shops like Santa’s TOYS, Evergreen Boutique & Christmas Shop, Rayelle Collection, and many more local spots. Especially for kids, it doesn’t get much more Christmassy than Santa Claus, IN. Natchitoches starts prepping for Christmas in June. This makes sense, since this small Louisiana town strings up over 300,000 lights annually. This celebrates not only the holiday season, but the Creole heritage of the region. Among the holiday festivities Natchitoches has to offer, you’ll find carriage rides, historic home tours, parades, and so much more. Most notably, there’s the Natchitoches Christmas Festival, a popular stop on the 8-city Louisiana Holiday Trail of Lights. During the fest, thousands of twinkling lights illuminate the Natchitoches downtown district as well as the Cane River Lake area. Over the course of 6 weeks, Natchitoches offers carriage tours through the National Historic Landmark District, fireworks each Saturday, a parade, the Northwestern State University Christmas Gala, and the Christmas Tour of Homes presented by the Natchitoches Historic Foundation. In fact, Yahoo! Travel ranked The Natchitoches Christmas Festival 3rd “Best Holiday Light Show,” behind Rockefeller Center and Disney Land. Downtown Natchitoches joins in the fun, with shops and restaurants staying open late during the holidays. So there’s no shortage of shopping, live entertainment, and carolers while food and craft vendors create a festive atmosphere for all to enjoy. Nowhere else offers the opportunity to celebrate Christmas, Creole style, like Natchitoches. Scenic and artsy, Asheville, NC is a great place to celebrate Christmas. Up first on a long list of holiday to-dos offered by this mid-sized college town, there’s Christmas at The Biltmore. A historic Vanderbilt mansion in the Blue Ridge Mountains, The Biltmore goes all out this time of year with food, decorations, and loads of on-property festivities. In Asheville itself, you can ride the Polar Express Train, check out the Aluminum Christmas Tree Museum, or spend a Victorian Christmas at the Smith-McDowell House. There’s also a national Gingerbread House Competition, and you can watch Santa make a “practice run” at his first chimney as he climbs Asheville’s nearby Chimney Rock monolith. While at Chimney Rock, kiddos can meet Santa and Mrs. Claus, while parents enjoy live holiday music. And everyone will love the complimentary hot cocoa and cookies. The little ones will particularly love all the kids’ activities and live critters available for viewing. These are only a few of the great Christmas activities offered in Asheville. You definitely won’t run out of things to do on your Christmas vacation here. While in Williamsburg for the holidays, be sure to visit Busch Gardens Christmas Town.There, you can see more than 10 million twinkling lights in North America’s biggest Christmas light display. Also enjoy two KIDsiderate areas with roller coasters, entertainment, and dining. Or instead, travel back in time to an 18th-century city in Williamsburg’s historic district. There, explore historic buildings, wander through gardens, and tread upon cobblestone streets. And while you’re in the historic district, be sure to notice a tradition dating back to the American Revolution as residents light a single candle in their window. There’s also caroling by torchlight and a gun-salute display. It’s the perfect way to celebrate Christmas for a history buff. But Williamsburg isn’t done yet. If Christmas lights are your thing, light it up at the Grand Illumination, a fireworks display held in downtown Williamsburg. After enjoying a meal or a drink downtown, you’ll have time to ooh and ahh at the festive decorations and listen to the seasonal music before the real show begins. These are only a few of the many things to enjoy in Williamsburg, without a doubt one of America’s best Christmas towns. I mean, c’mon – the town is called North Pole. It doesn’t get much more Christmassy than that. And this small town just outside Fairbanks does Christmas up right, all year long. So even in July, you can still find candy-cane posts in North Pole, as well as boughs of holly and a Santa Claus house (complete with live reindeer!). But the best time to enjoy this winter wonderland is, of course, Christmas. From one end to another, this town of 2,200 comes alive in December. For example, there’s the annual North Pole Christmas In Ice Contest, attracting ice sculptors from around the world. There’s also the Winter Festival, with activities and fireworks. And at the North Pole Post Office, more than 400,000 letters to Santa arrive. Where else would a letter addressed to “Santa Claus, North Pole, Alaska” end up? And yes, every year teams of volunteers work tirelessly to respond to each and every letter. Based on name alone, North Pole, AK deserves to be on any list of America’s best Christmas towns. If it weren’t so remote, we’d have scored it much higher. 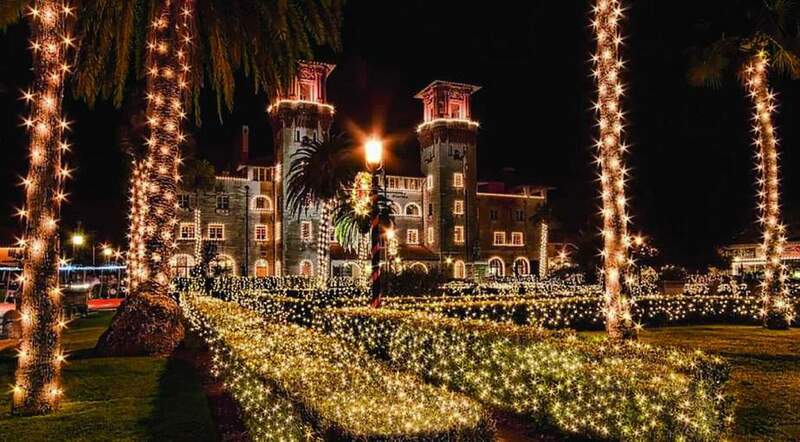 If you love everything about Christmas except, well, maybe the cold, consider spending our favorite holiday in St. Augustine, FL. The crown jewel of St. Augustine’s Christmas celebration is the Night of Lights, with more than 3 million white lights illuminating the city. In fact, National Geographic magazine deemed St. Augustine one of the 10 best places in the world to see holiday lights. 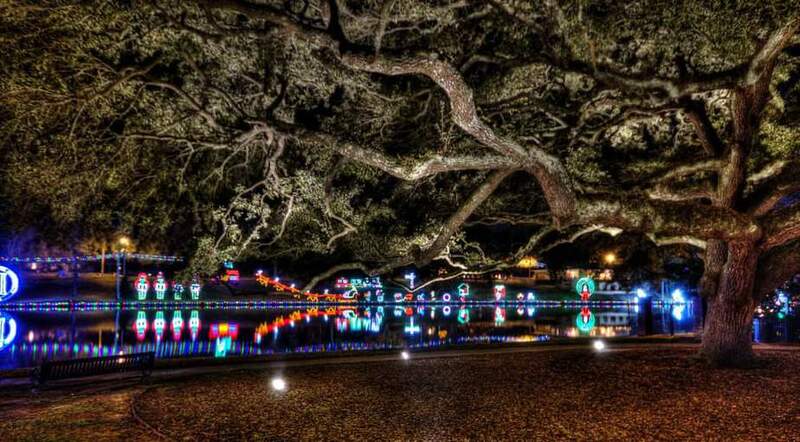 While in St. Augustine, take part in the Night of Lights Boat Tour. The boat tour happens 3 times a night. The first tour is all-ages, but only grown-ups are allowed on the last 2. But don’t worry, parents: There’s a bar on the boat serving refreshments no matter which boat tour you select. And speaking of drinks, beer fans in St. Augustine should check out Night of Pints, a beer fest featuring local St. Augustine breweries. For the kids, St. Augustine offers Ripley’s Red Trains Night of Lights Tours. For some, Florida’s balmy weather might put them off the Christmas spirit. But for those who love to be warm while jingling those bells, it’s hard to beat Christmas in St. Augustine. If your idea of a Christmas miracle is a gigantic Christmas megastore open year round, you should definitely head to Frankenmuth for the holidays. 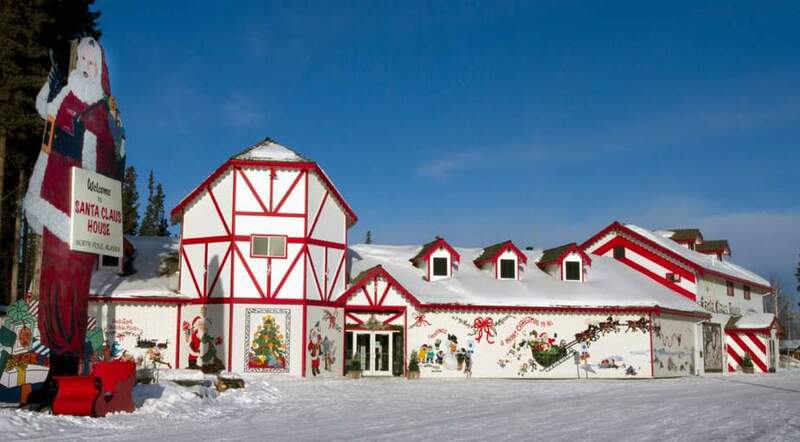 Frankenmuth is home to Bronner’s Christmas Wonderland, known as the world’s largest Christmas store. Bronner’s is the size of one and a half football fields, with over 50,000 gift and holiday decoration ideas. And it’s open 361 days a year, so the sights, sounds, and spirit of Christmas can surround you in every season. At Bronner’s, Christmas Lane is illuminated 365 days a year with over 100,000 holiday lights. And the Silent Night Memorial Chapel is wonderful to visit any time of year. If you do find yourself in Frankenmuth for the holidays, be sure not to miss The Old Christmas Station restaurant, complete with a museum of antique Christmas ornaments. 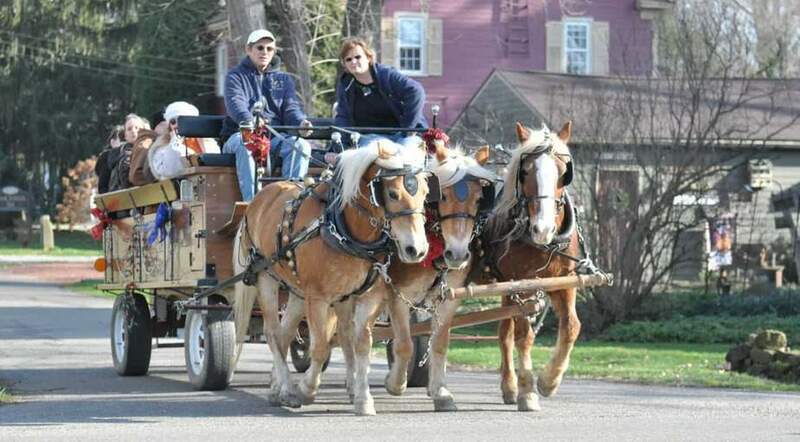 Elsewhere in Frankenmuth, you can experience an authentic European holiday market, or take a horse-drawn carriage ride courtesy of Fantasy Carriage Company or Frankenmuth Carriage Company. 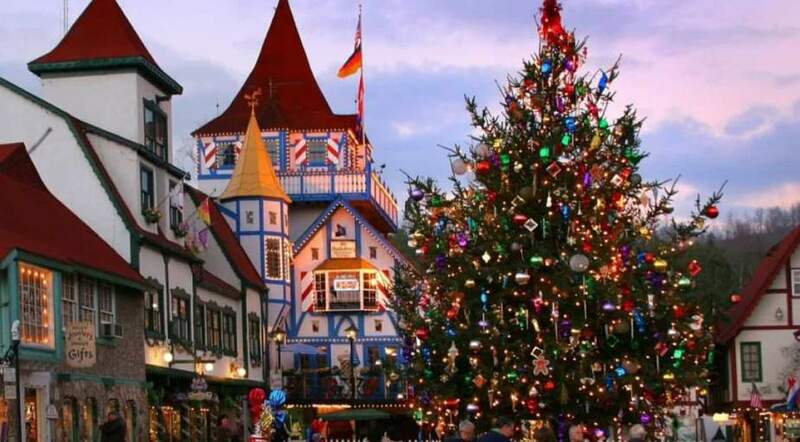 Some say visiting Frankenmuth for the holidays is a bit like strolling through a snow globe. You had us at “Christmas-themed megastore open all year,” Frankenmuth. If you’re headed to Vermont for the holidays, be sure to check out Woodstock’s Wassail Weekend. During Wassail Weekend, you can tour all the historic homes and farms in Woodstock, which graciously open up their doors for visitors during the holiday season. There’s also a Christmas parade, so don’t miss it. In addition to Wassail Weekend, there are lots of other Christmassy things to do in Woodstock. 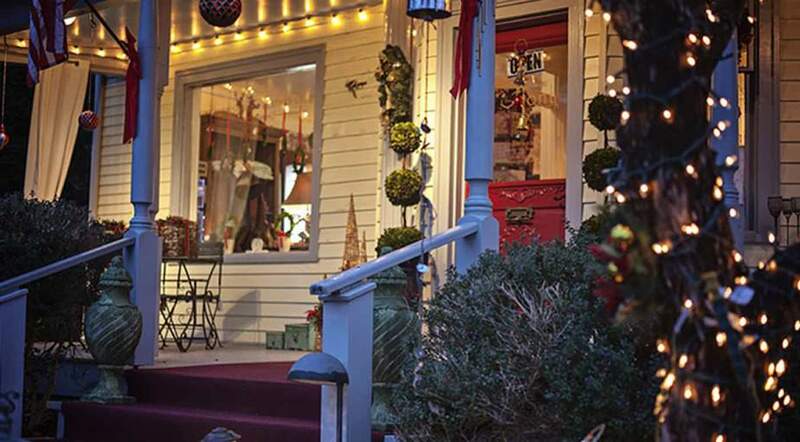 Check out idyllic Main Street, where stores and restaurants cheerfully display their seasonal spirit. You can also see quaint covered bridges from a horse-drawn carriage. And speaking of horses, where else would real-life horses and buggies circle the Village Green? It’s all like Christmas from a time gone by. So whether you’re partaking in a scheduled event, or just taking in the town’s magical atmosphere, it’s hard to imagine a better place than Woodstock to spend your Christmas. 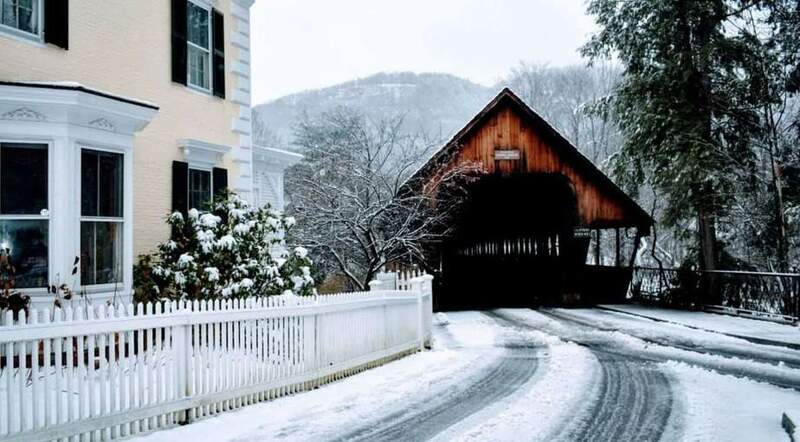 From quaint shopping to delicious dining, Woodstock is a winter wonderland. If seasonal charm is on your list, look no further than the small Bavarian town of Helen, GA. Located in the heart of Georgia, Helen is situated right on the banks of the Chattahoochee River. The town’s marquee Christmas event is called the Lighting of the Village. Here, attendees enjoy performances from local musical groups as Santa and Mrs. Claus light up the town center. Visitors in Helen can travel back to Victorian times at the Hardman Farm Historic State Site, where you can see the historic home dressed in period holiday décor while learning all about Victorian holiday traditions. Be sure not to miss The Christkindlmarkt, also in Helen. There, visitors can shop for gifts, decorations, and sweet treats. And see Santa swing through town as he makes his way from downtown Helen to the Festhalle on Edelweiss St. during the Annual Christmas Parade. What could be more delightful than Helen during the holidays? Their Christmas parade is followed by a bonfire and s’mores, so that sort of answers our own question: nothing. 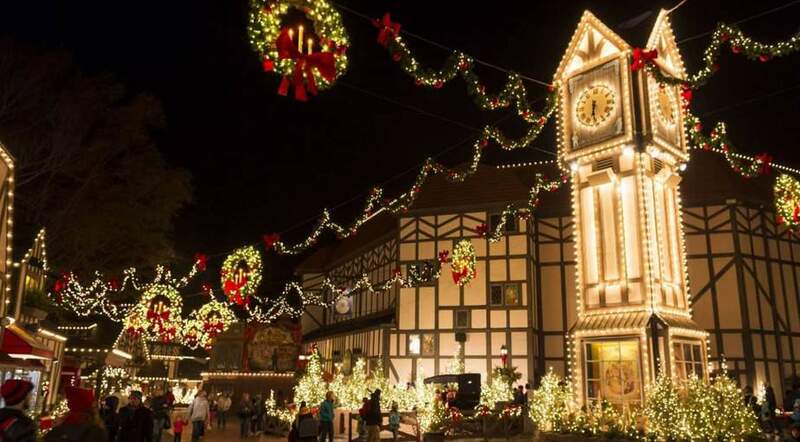 Like Old Germany with a southern twist, Helen, GA does Christmas right. If you’re a skier, or just a snow enthusiast in general, it doesn’t get much better than spending Christmas in Aspen. 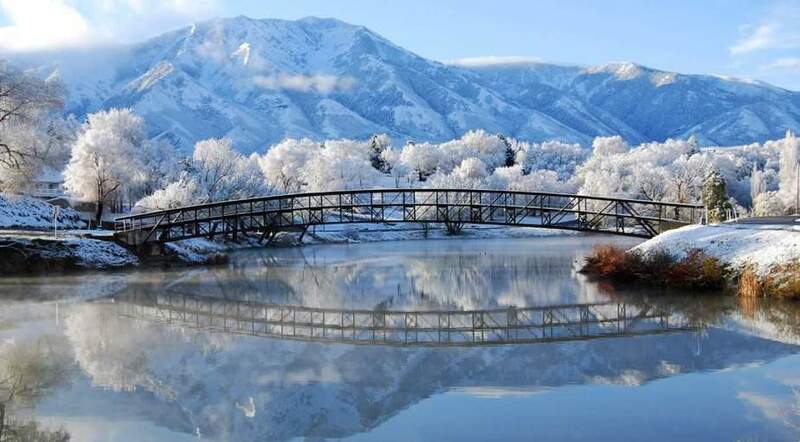 The town kicks off their holiday celebration every December 20th with the 12 Days of Aspen. During the festival, there’s plenty to do, with dozens of adult and family-friendly events all over town. Decorate cookies, visit story hours for children, sip free hot chocolate on the Cooper Street Mall, or listen to Victorian Caroling. For some of the best skiing in the country, book a spot on the Little Nell Powder Cat tours to Aspen Mountain’s backside. Then, enjoy a late lunch with wine in a cabin in the Elk Mountains. 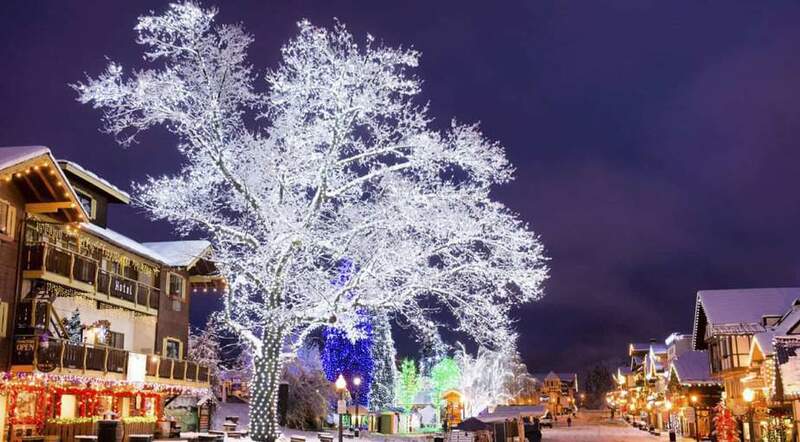 Other memorable holiday events in Aspen are the torchlight parade and firework show. You can also snowshoe by moonlight, sled at Aspen Highlands, or take a sleigh ride to dinner at Pine Creek Cookhouse. Young ones will marvel at the St. Regis Aspen’s massive gingerbread resort replica, made from 100 pounds of dough and measuring 2 x 12 feet. Ski towns and Christmas go together like hot chocolate and whipped cream. From ice skating in Central Park to the famous ball drop on New Year’s Eve, the beauty of New York at Christmastime goes without saying. And don’t get us started on the shopping! New York packs in so many holiday festivities, there are simply too many to list here. But for starters, there’s the Radio City Christmas Spectacular and Holiday Window Tour, featuring the Rockettes, Santa Claus, the Toy Soldiers, and much more. And perhaps most famous of all is the lighting of the Christmas Tree at Rockefeller Center. There’s also the Dyker Heights Lights, the biggest light show in all of New York. 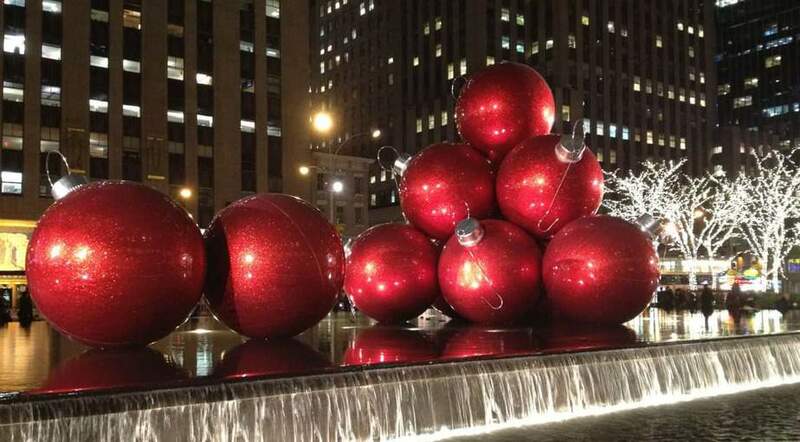 And if that’s not enough, tour the lights with the NYC Holiday Lights tour. Listen to the music of the season at the Harlem Gospel Holiday Celebration Concert. Or take in the Manhattan Holiday Yacht Cruise with Jazz Cocoa and Carols. All this, and much more, make New York a classic Christmas destination. 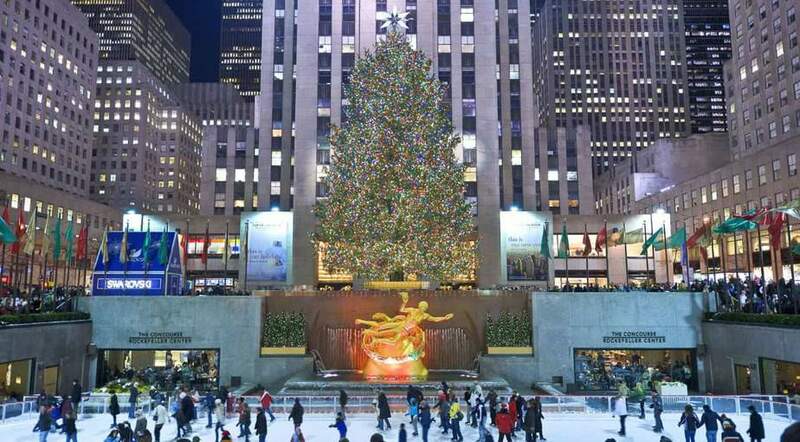 New York is a great place to visit all year, even more so around Christmastime. 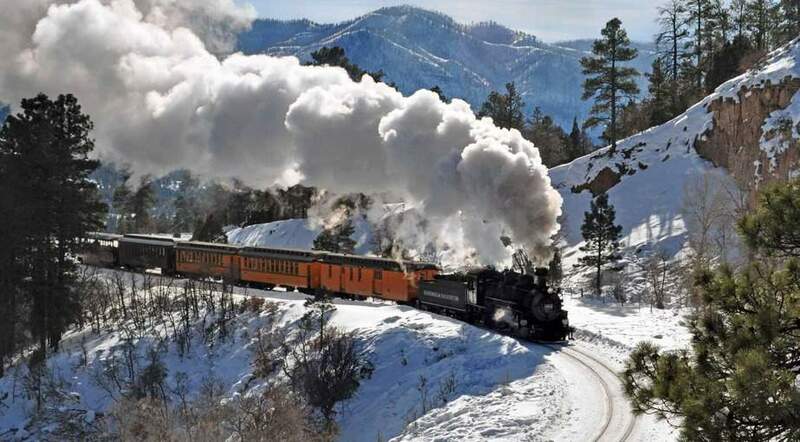 Snowy Durango, CO is home to one of Christmas’ most enduring icons: The Polar Express. So while visiting Durango, take your kids on a Polar Express Inspired Tour. All their Christmas dreams will come true. But that’s not all there is to do in Durango around the holidays. If you’re traveling with kids, check out the all-ages Parade Of Lights at Durango’s premier, 5-day winter celebration, Snowdown. During Snowdown, Durango goes all out (and it’s not all family-friendly). Festivities include mini-golf through 13 bars, beer dunks, an adults-only fashion show, and, what’s considered by many the highlight of the event, the Snowdown Follies. In Durango, you can take a sleigh ride through the scenic forests of Colorado, or take a dog-sled ride to natural hot springs. In addition, enjoy Christmas shopping downtown while sampling beer and wine. Whether at Snowdown or sledding peacefully through the alpine forests, picturesque Durango is an ideal place to enjoy Christmas. Some think of Nantucket only as a summer destination, but the tiny Cape Cod island offers plenty to do around Christmastime. Notably, there’s the annual Christmas Stroll, where attendees sip mulled wine while listening to carolers. 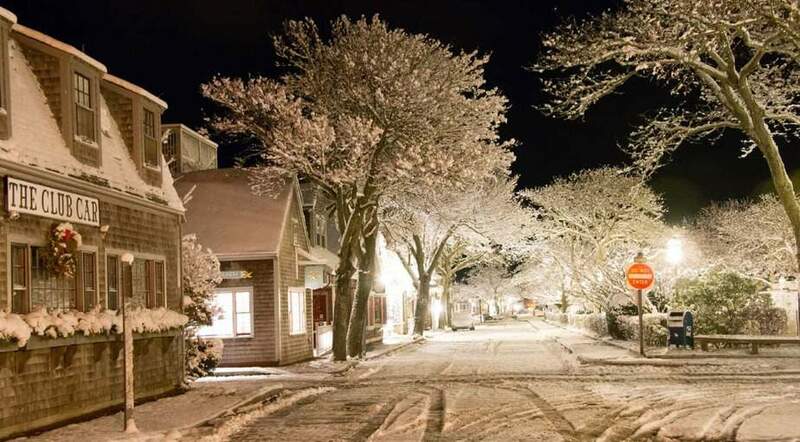 There’s also plenty of shopping in Nantucket’s quaint downtown, as well as a holiday market. On Main Street, there’s more caroling, an ugly sweater competition, a Christmas market, cookie decorating, ice carving displays, and an art show silent auction. And at the top of Main Street is the 20-foot king of all talking Christmas trees. What does it say? Head to Nantucket at Christmastime and find out. In Nantucket, Santa — of course — arrives by boat. Greet him at the wharf before heading to Jared Coffin House library to meet him one-on-one. There’s also a Festival of Trees, when the Nantucket Whaling Museum transforms into a winter wonderland, featuring more than 80 Christmas trees decorated by local business and organizations. Past themes have included lobster buoys, Barbie dolls, and strobe lights. That talking Christmas tree has us more than a little bit curious. To celebrate Christmas without freezing your rump off, consider heading to Naples for the holidays. In Naples, there are plenty of seasonal events — and you can even experience some snow! How? It happens every year during Third Street South’s Celebration of Lights. In fact, all the major shopping areas in Naples deck themselves out with lights and decorations from Thanksgiving to New Year’s. If shopping is your thing, head to the Village Shops on Venetian Bay, where you’ll find annual lighted nighttime boat parades. And on Fifth Avenue South, there’s a tree lighting ceremony, tuba Christmas concert, and festive holiday parade. Naturally, when many people think of Florida, they think of resorts. And all the local Naples resorts definitely get into the Christmas spirit. Perhaps most notably, The Ritz-Carlton, Naples has a life-size Gingerbread House, while Teddy Bear Teas with Santa Claus thrill the kids. So don’t let the warm weather put you off visiting Naples for Christmas. 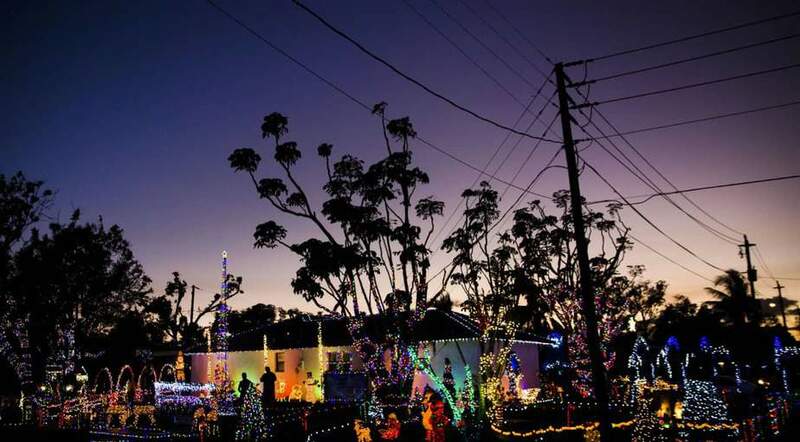 There’s plenty of holiday cheer to be found in this Florida town. It might be hard to imagine Florida feeling very Christmassy, but Naples does it right. 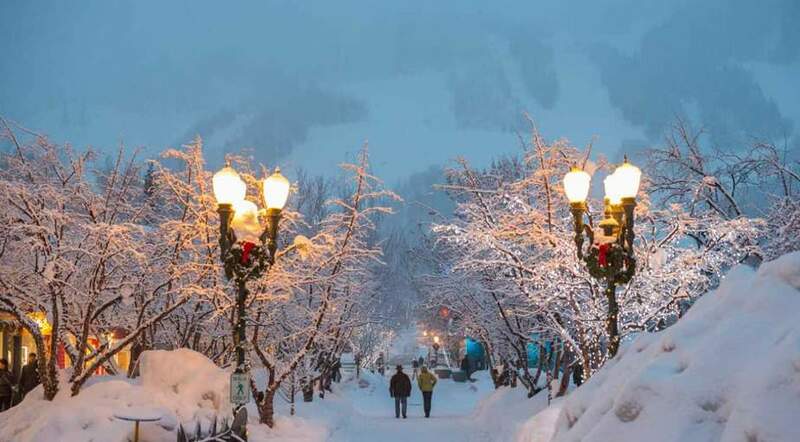 Park City, UT is a scenic and snowy place to spend the holidays. This small ski town offers plenty to do during the Christmas season. Fun seasonal events include the Tree Lighting Ceremony, where Santa is available for photos and gift requests. And there’s even a firework display! 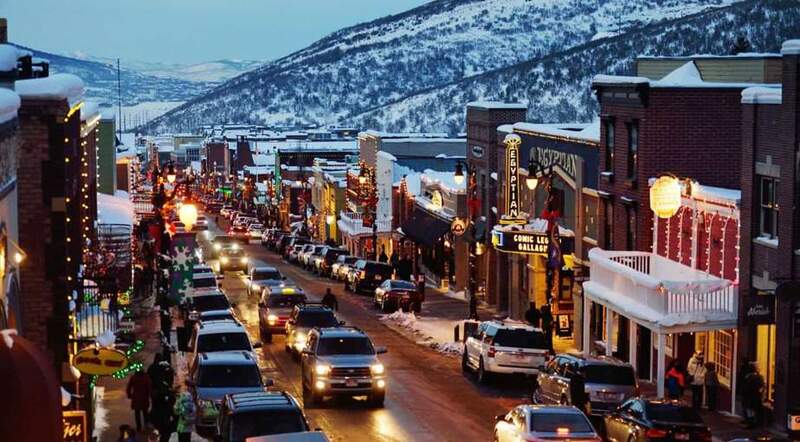 Main Street Park City is home to the Electric Parade and Festivities, at which participants can win prizes awarded by a panel of local judges. Also on Main Street are plenty of dining and shopping options. Elsewhere, Park City’s Egyptian Theatre hosts the Park City Holiday Spectacular Sing-a-long, featuring a choir-led sing-a-long of all your favorite Christmas music. For families with little ones, see Santa come down Park City’s Town Lift. You can also hear live music at Park City’s Snowfest, or visit Santa at Deer Valley Resort. Deer Valley also hosts the annual Torchlight Parade, complete with cookies and hot cider served in Snow Park Plaza. This Christmas town isn’t just for ski bums. For wine enthusiasts, this Sonoma County town, right in the heart of wine country, is a great place to spend Christmas. 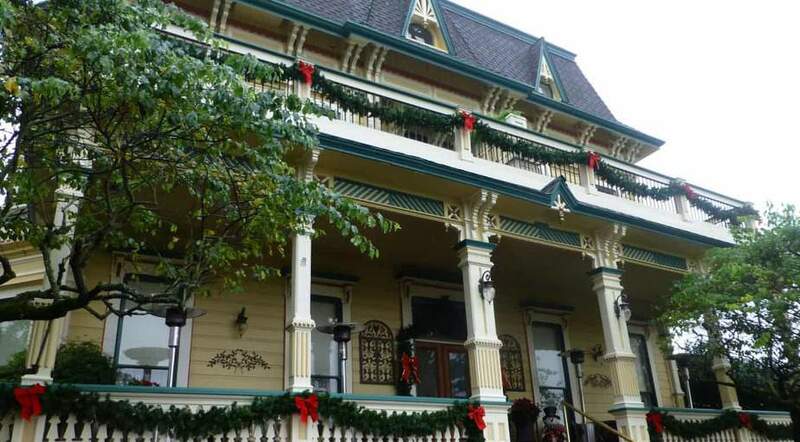 But you don’t have to love wine to enjoy the holidays in Healdsburg. There’s so much more to do! First up is Holidays in Healdsburg, a seasonal tradition in Sonoma County. During the event, participants enjoy a 4-hour guided fine wine and foodie walking tour. Attendees enjoy the Christmas tree plaza, colorful street decorations, and festive window displays. You can also take a variety of other walking tours in charming downtown Healdsburg. Sample gourmet appetizers while sipping on world-class Sonoma County wine, all while strolling along some of the most festive blocks of the city. Or take a ride in a horse-drawn carriage! Check out Toys on the Go at the Healdsburg Museum. Marvel at the model train village decorated for the holidays, or travel down memory lane with vintage toy exhibits. Don’t miss Dine Around, a Healdsburg holiday tradition in which 15 of Healdsburg’s best restaurants offer a 3-course progressive meal. Whether or not you’re a wine lover, Healdsburg is a great place to enjoy Christmas. Everyone knows about the National Christmas Tree and the White House’s lavish Christmas displays. However, there is so much more to do for Christmas in our nation’s capital. 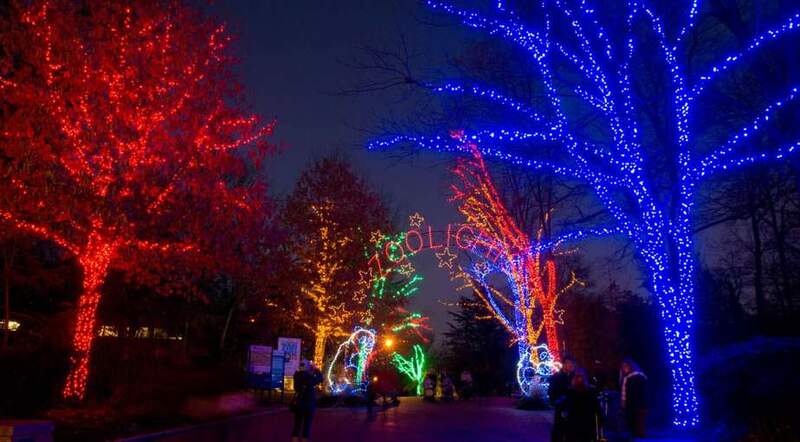 If you’re in D.C. for the holidays, be sure not to miss Zoolights at the National Zoo. There’s also Gaylord National Resort’s ICE!, an interactive holiday attraction made from 5,000 blocks of ice weighing 1.5 million pounds, hand-sculpted by 40 international artisans. Or take a candlelight tour of the area’s historic homes. In fact, several house museums in Maryland and Northern Virginia welcome visitors with seasonal music and holiday treats. There’s an amazing lineup of holiday shows and live entertainment in D.C. during the holidays. D.C. is also known for a number of model train exhibits, such as the Norwegian Christmas Train Display at Union Station, or Seasons Greenings at the Botanic Garden. All of this and more makes D.C. one of America’s prime Christmas destinations! Those who’ve been say there’s no place quite like Charleston to spend the holidays. And this southern town is absolutely packed with seasonal things to do — even if it means making a snowman from sand instead of snow. 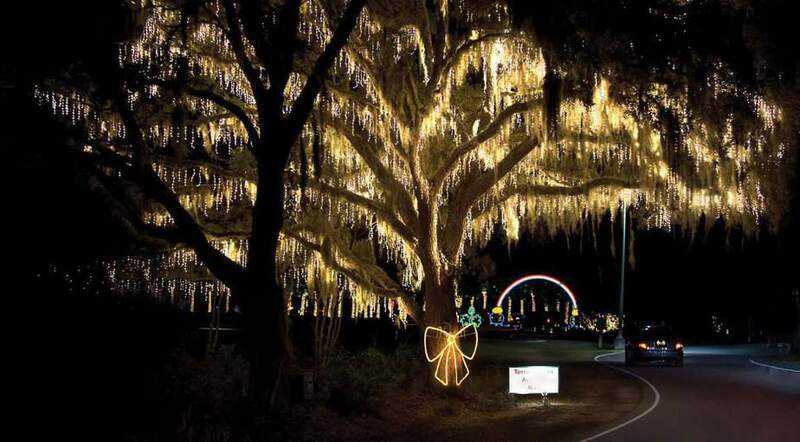 Perhaps Charleston’s most notable attraction around Christmastime is the Annual Holiday Festival of Lights, a 3-mile driving tour accompanied by marshmallow roasting, festival train rides, an old-fashioned carousel, and much more. On any one of downtown Charleston’s multiple walking tours, you can see beautiful antebellum mansions, decorated for the holidays. Charleston is known for its amazing coastline, and a parade of festive boats sails through Charleston Harbor every year. It’s not to be missed. Charleston’s Historic Dock Street Theatre, known as “America’s First Theatre,” presents an annual Christmas show. It’s a favorite event among locals and visitors alike. There are amazing concerts of Christmas music with a gospel twist, one-of-a-kind historic hotels decorated for the season, great shopping, and a whole lot more. It all makes Charleston one of America’s best Christmas towns. Charleston’s mix of scenic beauty and southern charm makes it a great place to spend the holidays. The Christmas in Zoar celebration showcases old-fashioned, naturally decorated historic house museums. While in Zoar, you can also enjoy musical entertainment, a juried craft show, a village tour, and much more. Make sure to visit Belsnickle and Kristkind, traditional German gift-bringers. And after that, take a horse-drawn wagon ride around the village. You can also attend a candlelight church service at the Historic Zoar Meeting House, followed by a procession to the Historic Zoar Garden and a tree lighting ceremony. You can even buy your Christmas gifts directly from folk and craft artists as they peddle their wares at places like a historic school house. Blacksmith and tinsmith shops feature local artisans producing their wares the old-fashioned way. The tiny village of Zoar, OH is an ideal place to experience how Christmas was celebrated in years past. The Charlottesville, VA area teems with special holiday events from shortly after Thanksgiving through the new year. 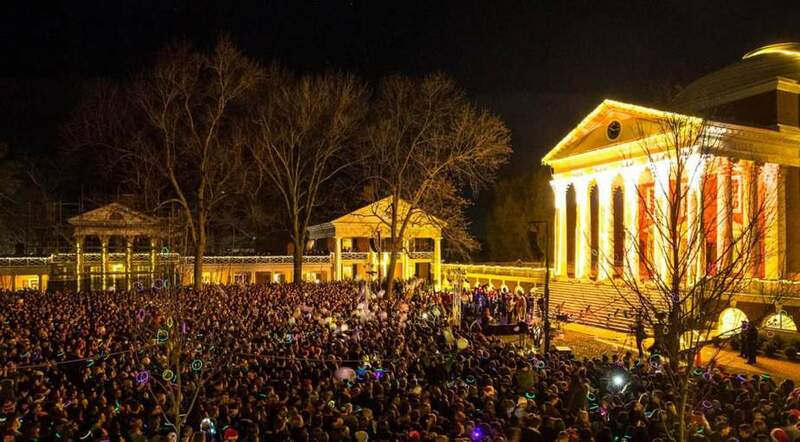 Events like the Lighting of the Lawn at the University of Virginia draw thousands of people each year to Thomas Jefferson’s historic university. Taking place in early December is Grand Illumination, a holiday tradition that attracts hundreds of visitors and locals to Charlottesville’s Downtown Mall. Attendees watch as their beautifully decorated tree sparkles with more than 20,000 lights. Charlottesville hosts the Barracks Road Annual Holiday Parade and the Wells Fargo Holiday Heritage Parade. 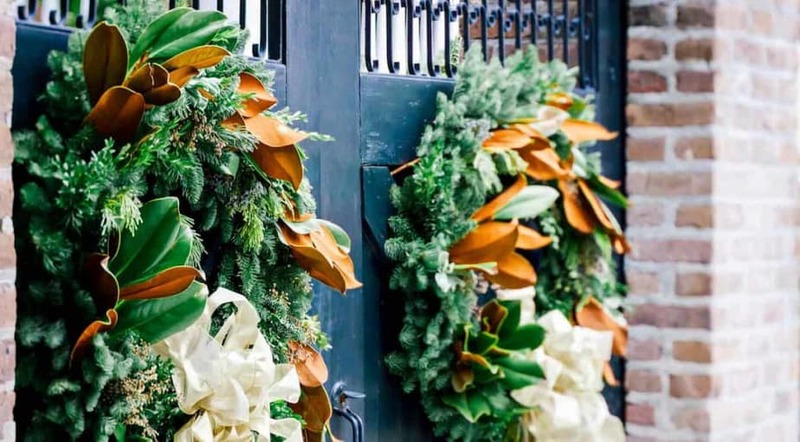 Holiday events at Thomas Jefferson’s Monticello include wreath-making workshops and a free holiday open house. Other festivities include a children’s woodland ornament workshop. There’s also the Monticello Holiday Classic 5K and Deck the Halls Kids Dash. And, of course, there’s plenty of shopping at both Charlottesville’s vibrant downtown district and the town’s annual holiday market. From holiday markets to historic tours to well-loved parades, few places outdo Charlottesville around the holidays. Nestled near Santa Barbara, Solvang, CA is home to Julefest, which lasts all December. Part of Julefest is the Skål Stroll 2-Day Wine & Beer Walk. And kiddos love to visit Santa in Solvang Park. There’s also the Solvang Nativity Pageant, and the Solvang Julefest Parade. In the parade, 400 participants and 50 entries make their way along the festively decorated streets of Solvang. You can also catch the Solvang Tree Lighting, tours of holiday lights, a Santa Sprint, a farmer’s market, lots of holiday concerts, and plenty of shopping. Something unique to Solvang around the holidays is the Nisse Adventure. Nisse are mischievous elf-like Danish figures. In this fun, free, self-guided activity, families go at their own pace, using a map to find these festive little gnomes hidden in different locations around Solvang. Find them all and win a prize. 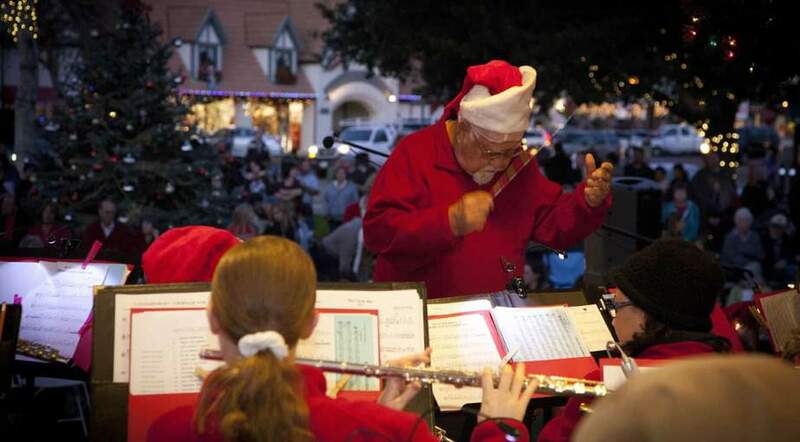 Solvang is one California town that knows how to do Christmas right. Lewisburg, WV has been voted one of America’s Coolest Small Towns. And it’s a great place to visit around the holidays. Charming year round, Main Street Lewisburg transforms into something wondrous for the holidays, when the shops and restaurants go all-out with the holiday decorations. There’s also a holiday open house in downtown Lewisburg, with street performances, carriage rides, and treats. If you’re headed to Lewisburg, check out the Greenbrier Resort, just outside town. This festive hotel features seasonal activities including parties, tree lightings, and a Gingerbread Ball. At Greenbrier, Mrs. Claus can be found in her Christmas shop, and Santa assists in lighting up a 60-foot Christmas tree accompanied by festive carolers. And don’t miss the Greenbrier Valley Chorale Christmas Concert. 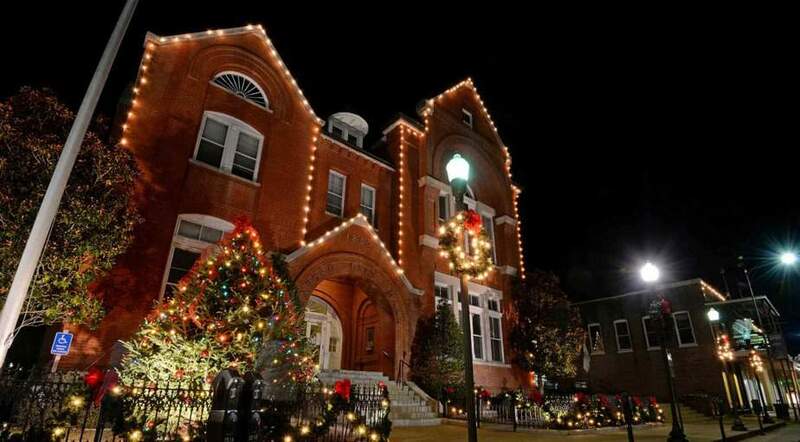 Lewisburg is a great place to spend the holidays if you’re looking for a laid-back vibe. 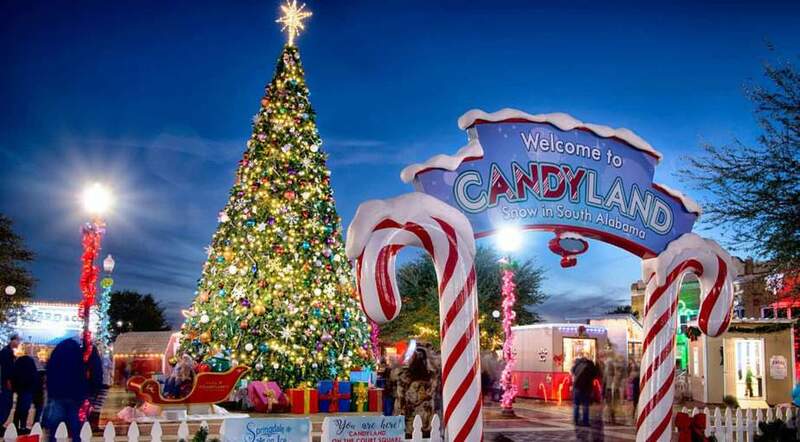 Head to Andalusia, AL around the holidays for Christmas in Candyland, a true winter wonderland. At the kid-friendly event, children of all ages can ice skate, visit the different holiday cottages, and meet Santa. There are even snow flurries every weekend to go along with beautiful holiday lights. At Candyland, you’ll find South Alabama’s largest snow tubing hill as well as Springdale on Ice, a skating rink. Enjoy a train ride on the Springdale Express, or try the Arctic Trek, a polar bear maze. There’s all this and a whole lot more for kids and families. The best part? Admission to Christmas in Candyland is totally free! You can see why Andalusia was voted among Southern Living’s Top Small Towns in the South for Christmas. Does your idea of a good Christmas include a real gingerbread village, holiday market, Santa’s Workshop, and a hometown parade? If so, you might want to consider visiting Oxford for the holidays. Take in the festive gingerbread house village displayed at Oxford’s Holiday Village, featuring structures made by volunteers. The event benefits local food banks. Or participate in Oxford’s annual Holiday Ornament Auction. There’s also a Christmas parade, tons of great southern food, and Oxford’s Nights of Lights, where you can follow a digital map of local homes showing off their best light displays. Pay a visit to the University Museum for a family day packed full of festivities that include making seasonal crafts, snacking on holiday treats, and touring the gingerbread village. Christmastime in Oxford proves there’s more to this college town than football.